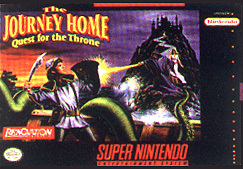 The Journey Home was one of several unreleased games by Renovation. It was an overhead Zelda-esce game. This game was never released, but it was completed. The Japanese version of the game is called Neugier - Umi to Kaze no Koudou. It was developed by the Wolf Team, and published in Japan by Telenet. It is an action rpg game similar to The Legend of Zelda. The game was reviewed by Nintendo in their publication "Official Super Nes Game Guide". It received slightly above average scores (a total score of 3.2). Since Sega purchased Renovation, the game was not released.